Sisters in Crime Orange County presents LADIES OF INTRIGUE October 7th! Upcoming Events from Sisters in Crime Orange County! The Sisters in Crime Orange County chapter offers several upcoming events we wanted to make our Los Angeles members aware of. In Parker’s new novel, SWIFT VENGEANCE, Roland Ford is hunting down a mysterious killer, jockeying for position with the FBI, and risking everything to save a friend in terrible jeopardy. Free Luncheon Buffet. Open to the Public. RSVP: secretary@ocsistersincrime.org by THURSDAY, AUGUST 23, 2018. 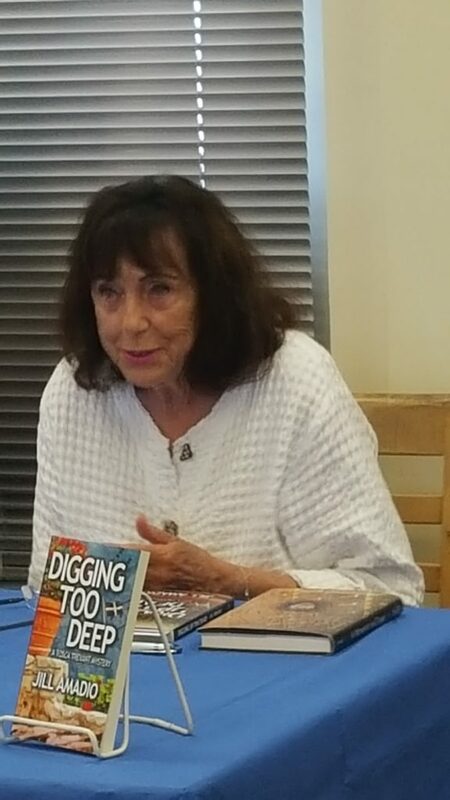 Representing a diverse group of mystery genres, four members of Sisters in Crime appeared on a panel April 14th, 2018, at the Culver City Julian Dixon Library to discuss their personal paths to publication and take questions from the audience. The panel, entitled “I Think I’d Like To Write a Book (Someday),” spoke to authors to help them understand the various routes to publication, such as traditional versus self-publishing, as well as the wide possibility of crime genres to explore. Lida Sideris, author of Murder and Other Unnatural Disasters, served as moderator. Authors on the panel were fiction authors Connie diMarco (All Sides Point to Murder) and Sheila Lowe (Written Off), along with true crime author Catherine Pelonero (Absolute Madness).